I think the whole syuzhet controversy is turning out to be fabulously productive. I particularly enjoyed David Bamman’s latest contribution to the discussion, which begins to flesh out what validation might look like for questions about plot. 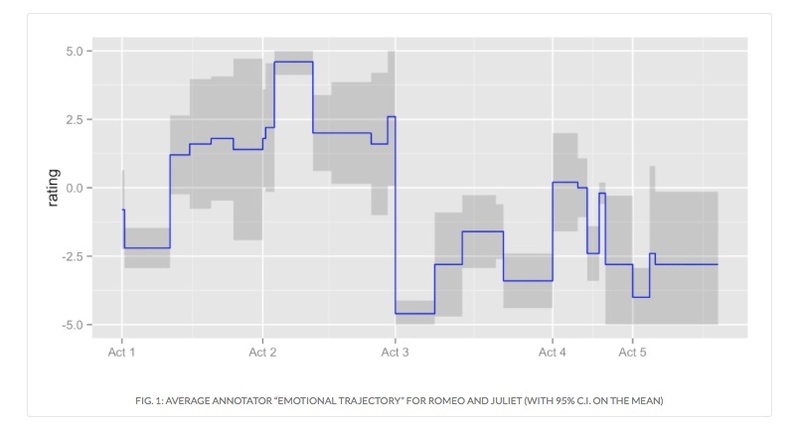 Briefly, he got five human readers to evaluate the emotional pitch of different scenes in Romeo and Juliet, and visualized the range of their agreement over time. It’s clear that there are differences; but it’s also clear that there’s a great deal of consensus. And not surprisingly. Romeo and Juliet is (spoiler alert) a tragedy, and the simple, strong difference in perceived tone between the first and second halves of the script is exactly what we might have expected. She’s right. It’s a well-worn thesis about the rise of the novel that the point of novelistic realism was, partly, to get away from the predictable trajectories of comedy, tragedy, and romance — to produce a messier arc with lots of contingent interruptions (people hate it when I cite this guy, but that’s Ian Watt’s conception of formal realism). If that’s true, David’s experiment might not work as well for novels. Matt Jockers’ syuzhet package is based on a diametrically opposed account of novelistic plot, coming through Kurt Vonnegut. Vonnegut argued that novels are really still organized by a small number of predictable patterns moving, in fairly broad undulations, between fortune and misfortune. And … wait, that sounds plausible too. The conflict between Vonnegut and Watt might give us a testable question with clear literary stakes. Are the perceived emotional trajectories of novels in fact more complex over time, or more uncertain at any given moment, than the perceived trajectories of (say) 17c comedy and tragedy? Watt says they should be. Vonnegut says no. To be sure, there are lots of complexities involved in answering this; “emotional valence” is still not very well defined. But with a question like this, where theories of the novel clash directly, it’s hard to fail — whatever you discover, you’re going to be overturning some well-documented received opinion. There are potentially lots of ways to approach a problem like that. David’s sort of ground truth could be used as a foundation for predictive modeling, or we could use it to validate Jockers’ method. By the way, if anyone’s still interested in doing that, here’s the trajectory you get if you run Romeo and Juliet though syuzhet using afinn sentiment detection and a low-pass setting of 5. Compare it to Bamman’s human ground truth above. One example is not validation, and this is just an eyeball comparison, but it’s a pretty decent fit. And syuzhet was incredibly easy to install and run. I did this in literally five minutes. My gut is starting to tell me that’s a nice little R package Matt just gave away for free. Then again, if predictive models or sentiment detection don’t work well enough to satisfy us, there’s no reason why a question like this couldn’t be pursued purely through human annotation. I don’t have time to tackle this question; I’m working on a different project where human ground truth is provided by reviewers. But I really think someone should go for it. 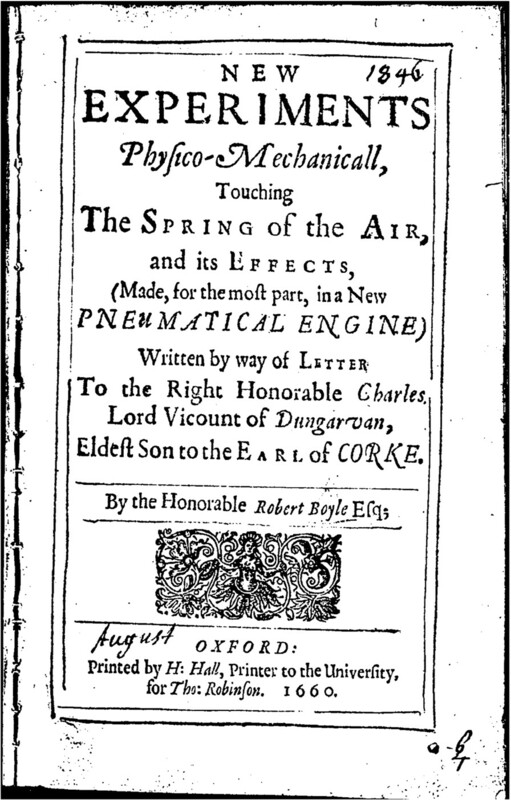 Robert Boyle’s description of a controversial, notoriously leaky air-pump. For me the lesson of this conversation has also been that the open web and dissent are still good things. I’m glad Matt Jockers put syuzhet out there as a resource, and glad Annie Swafford critiqued it. I’ve been saying this reminds me of the Hobbes-Boyle dispute; I mean partly, as Anna Marie Roos points out in a review of Leviathan and the Air-Pump, that the clash between opposing interpretations in that case fruitfully advanced knowledge. 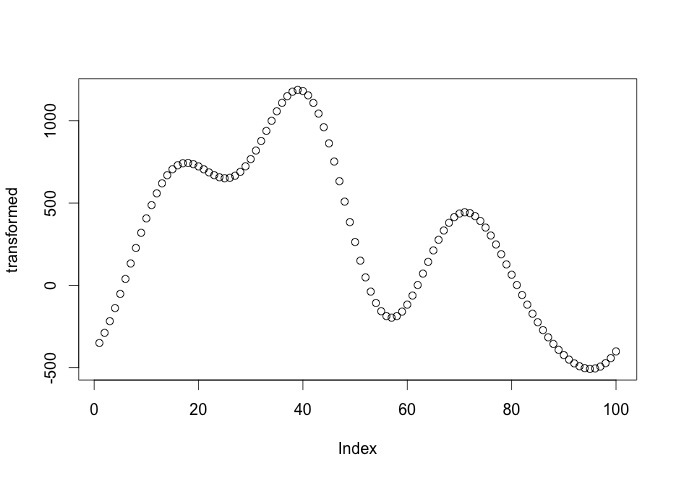 I also mean, of course, that experiments, with clearly defined predictive hypotheses, are good things. 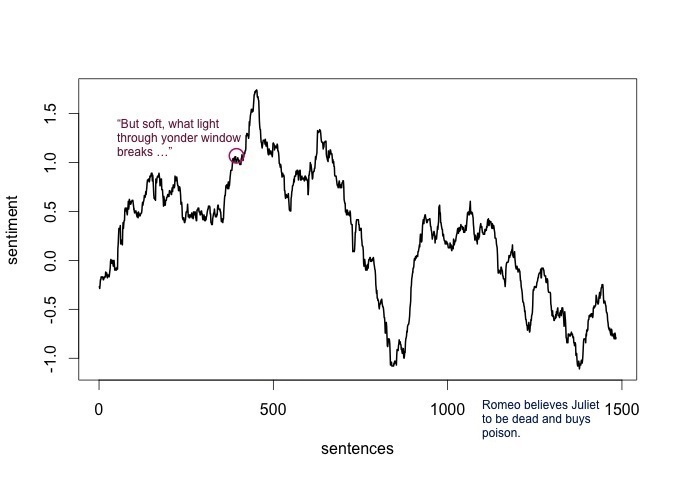 PS: By the way, if anyone’s interested, here’s Romeo and Juliet smoothed with a rolling mean (using a 101-sentence window) rather than a Fourier transform. I still understand rolling means better, and I think the detail revealed here is interesting. The balcony scene is, unsurprisingly, the high point for human readers and sentiment detection alike. As David Bamman points out, readers are a bit divided about how to interpret the tone at the end of this tragedy. Syuzhet, however, considers it a downer. P.P.S: Thanks to David Wilson-Okamura for correcting my labeling of scenes. This entry was posted in fiction and tagged digital humanities by tedunderwood. Bookmark the permalink.